Get comfortable in this newly renovated apartment. You'll appreciate the large living areas, whether you are settling in for movie night, a good read, or have a bit of work to finish up. The beautifully designed and well furnished kitchen gives you the option of eating in, without ordering out. Enjoy the beauty of Arizona from your balcony. Drift off to sleep in the comfortable, queen sized bed in a room that provides plenty of storage and space. We look forward to helping you settle in at the Residences of Stadium Village. We enjoyed our stay in the first floor unit with easy access to a nice pool area. All aspects of the unit were as advertised with the exception of no washer and dryer. There was a lack of information on checkout procedures and a shortage of cleaning supplies and paper products. The leasing office was very helpful. The unit is very clean and we would go back again. There are a lot of restaurants nearby and plenty of things to do. This property is beautifully decorated and spotlessly clean. Easy to get to and convenient for anything you are doing in the west suburbs. The layout of the unit has the two bedrooms separate with a bath easily accessible for both bedrooms making this place a nice option for 2 couples or a family sharing the space. The pool is right outside the door. Tyler was very responsive and answered questions quickly. Everything was in place just the way we anticipated. Suggestions? If you plan to cook, the pantry is not stocked with staples you would need for cooking (spices, oil, etc). Overall, our stay was great and we would definitely return. This is a really great place to kick back and relax. The location is very convenient to stores and restaurants. The pool, hot tub, exercise room, and barbecues were all well maintained and accessible. The customer service of the staff is exceptional! We needed a few maintenance items addressed, and staff were very helpful, and the repairs, etc. were done in a very timely manner. The only downside is the number of kitchen items. Would have been nice to have more than four place settings of dishes, maybe a drink pitcher, and some plastic glasses to use out by the pool. The bathrooms only have one towel bar, so there is no place to hang a hand towel. Not very practical. It was nice to have a washer/dryer and iron and ironing board in the apartment. Overall, excellent place to be, and I will definitely come back and stay here in the future if it is available. Spacious, well kept unit with great pool and hot tub, walk to Spring Training. We had 4 adults in the unit, plenty of space, very clean. The pool deck area was great! I would definitely look to this property for our next Phoenix area visit. Perfect for Spring Training in Surprise! Tyler was extremely responsive and made sure our stay was excellent. We walked in and were very impressed. Beautiful apartment, comfortable beds would definitely come back. Whether you are coming to Surprise for work, vacation, Spring Training, or a combination of all of the above, our apartment community comes with easy access to the neighborhood’s best destinations for everything from major retailers and restaurants and pubs to major employers, and top area attractions. The open green spaces and stunning scenery of Surprise Community Park will become a favorite spot to pass your free time. We are located across from Surprise Stadium, home training ground to the Texas Rangers and Kansas City Royals. Thirteen golf courses are within a 5 mile radius and Phoenix Cardinal stadium is 15 minutes from your front door. 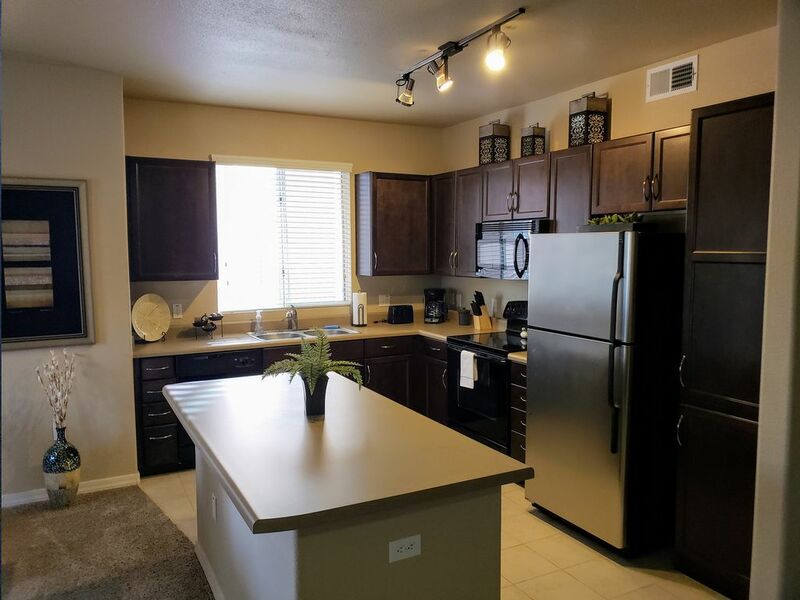 Commuting, if necessary, if made convenient thanks to our close proximity to major thoroughfares, including West Bell Road, West Grand Avenue, and Arizona State Route 303. Surprise, Arizona is an vibrant community with lots to offer. We look forward to helping you find the best in our community.